Our lovely young patient unfortunately broke her nose at a concert resulting in a right sided nasal blockage sufficient to cause her to mouth breathe. She also noticed sinus type headaches and minor but recurrent nose bleeds. 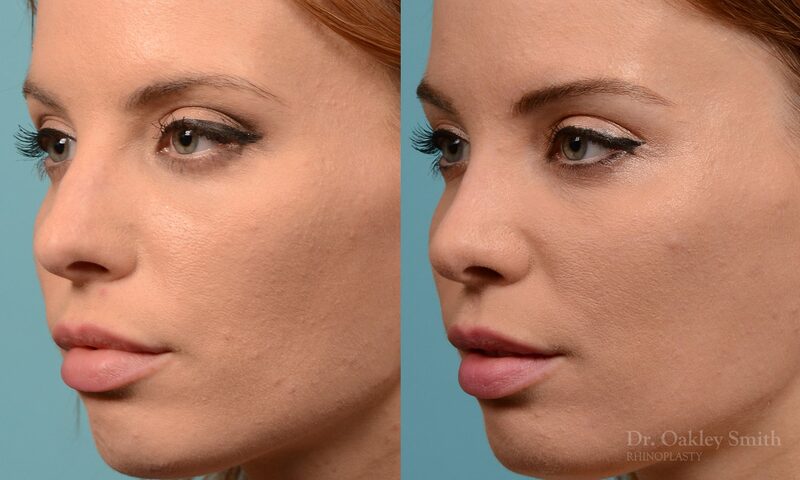 She wished for a straight nose, a feminine profile, less projection of her nose and smooth nasal side walls. During the consultation Dr Oakley Smith felt four millimeters of de-projection could be obtained and the probability of getting so was 90%. 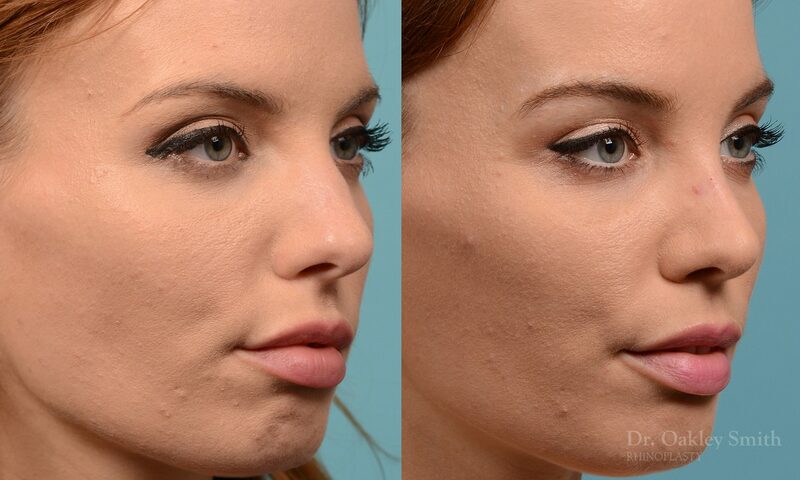 However the degree of scarring from the accident was much more than expected at the time of surgery and this limited the de-projection to only two millimeters. It was not possible to recognize the amount of scarring below her skin beforehand and hence the overestimation. The damage arising from her injury also caused other issues at the time of surgery. Her nasal bones had thickened and when they were broken to narrow her bridge, the bony plates fell into the nose such that a ridge in the form of an inverted V was created. 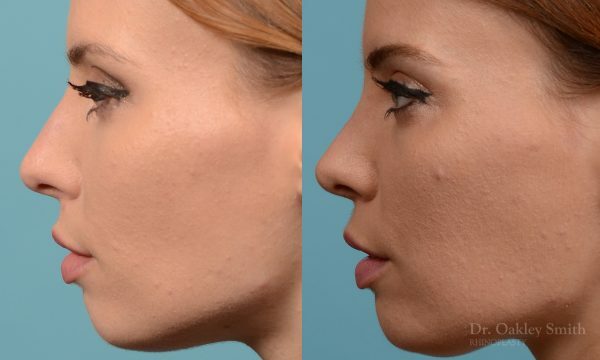 To prevent this from ruining her outcome, Dr Oakley Smith placed cartilaginous spreader grafts between the depressed fragments and her septum to support the bones outwards. 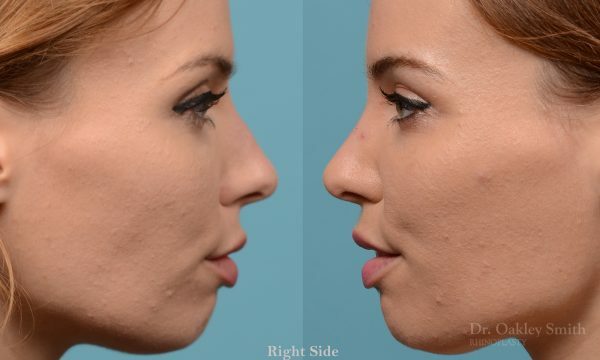 This is a good example of the unexpected issues which arise during rhinoplasty and require a surgeon to have the experience and techniques available to correct them. 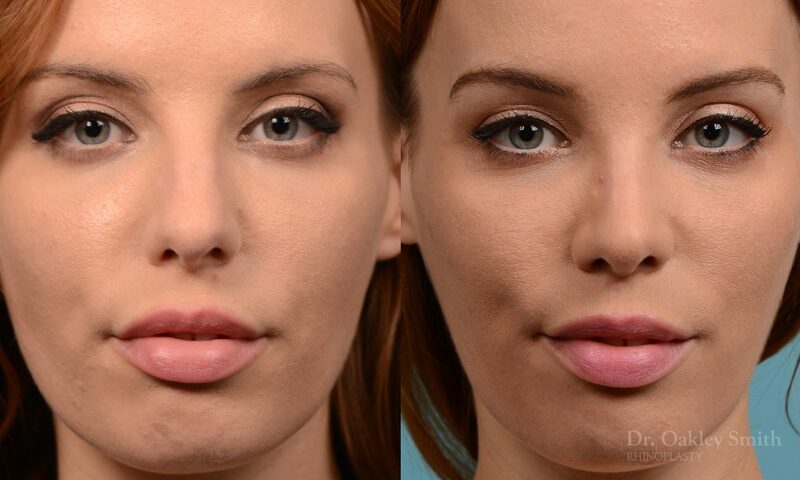 After her rhinoplasty her nasal bridge is narrower and straighter. She has a subtle curve to her profile, her nasal bump has been removed and there is even better symmetry to her nostrils. These before and after rhinoplasty photographs illustrate some of the unforeseen complications which can occur during rhinoplasty surgery and the need for an experienced facial plastic surgeon able to deal with them.